For first choice date. Availability: Monday - Thursday, 5:30 pm. Friday, 5:30 - 6:30 pm. Saturday, 12:30 pm - 7:30 pm. Sunday, 12:30 pm - 4:30 pm. For second choice date. Availability: Monday - Thursday, 5:30 pm. Friday, 5:30 - 6:30 pm. Saturday, 12:30 pm - 7:30 pm. Sunday, 12:30 pm - 4:30 pm. Please select a location for your pregnancy henna appointment from the menu below. If you selected a home or special location for your appointment, please provide the address below. Please select any additional henna pieces you plan on receiving during your appointment. Please check the box below is you would like your tattoo to be dried and wrapped with latex-free medical tape (free). If your requested dates are not available, you will be emailed with open appointment times. A deposit through PapPal may be required to verify your appointment (you will be directed to do this via email, if required). 100% of the deposit will go towards your henna on your appointment date, but may not be refunded if your appointment is broken within 48 hours of the original appointment. Thank you for your appointment request! You will be emailed back within 1 - 3 business days. 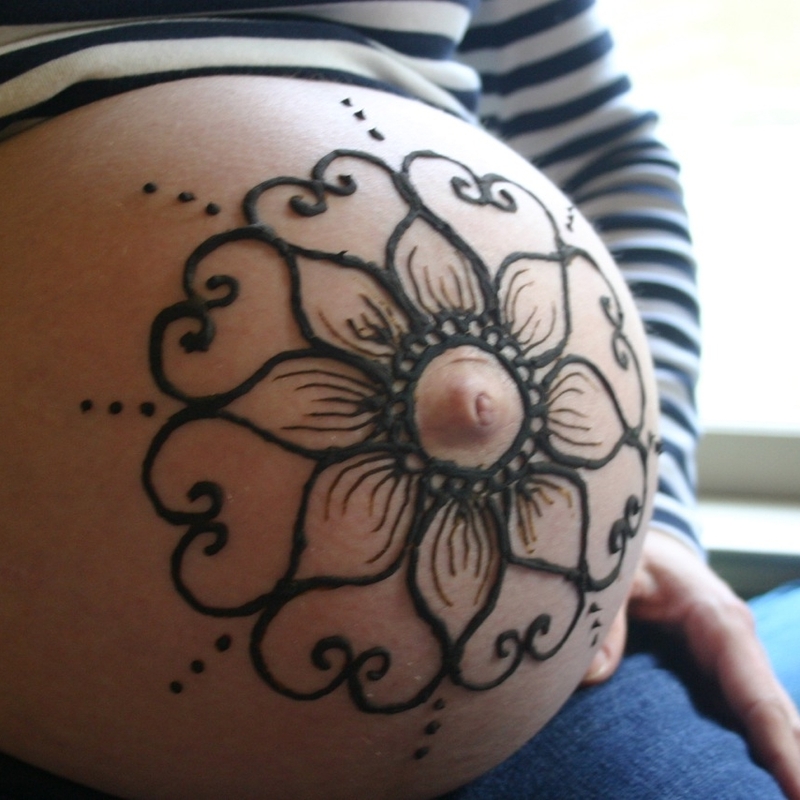 Henna is a beautiful way to honor the experience of carrying a child. It is incorporated into baby showers, baby blessings and pregnancy photography all over the world. Read details about how J.U. Henna Tattoo does pregnancy henna appointments, and when you're ready, fill out the appointment request form (located above) to get started! Traditional henna (red/brown color) is priced below as the standard. White henna and Swarovski crystals are charged as add-ons. To make an appointment, $10 will be removed from your henna's price and collected up-front as a deposit (via PayPal). The remaining rates will be collected during the henna appointment. Pregnancy henna appointments can be done where you feel most comfortable. Feel free to put your feet and enjoy a cup of tea - these appointments can take a few hours, so I recommend an at-home appointment. You can choose any location that is comfortable to you as long as it has seating for two. A travel fee will be added as part of your deposit: $20 per hour of total travel (accounts for travel to and from appointment). If paid parking and/or tolls are required, this will also be added to the deposit. My starting location is shown on the map below. I am a floral and mandala expert and can free-form unique and beautiful artwork on-the-spot. If that isn't your thing, feel free to print or send me a photo and I will gladly mimic any henna piece you prefer! Below are my available start-times for pregnancy henna appointments. Henna is made from all-natural ingredients and is generally safe for both mommy and baby-on-board. However, it is recommended you read the ingredients, and if you feel necessary, consult your doctor before receiving henna. Henna should be avoided or used sparingly if you are extremely anemic or have G6PD deficiency. After applying a fresh henna tattoo it is important to avoid friction. For this reason, henna is usually left exposed and in the open-air for a few hours after the application. However, after receiving henna in areas like the belly, it is sometimes necessary to put clothing on top of the tattoo right after the henna appointment. For this reason, I provide the option to blow-dry each henna piece and wrap the area with medical tape (latex-free) to protect the henna pieces from being rubbed-off by clothing. This step can take up to 30 minutes from start to finish. Some people like this extra-protection for their henna tattoo so they can put on a shirt and move on with their day. Others prefer to wear a sports-bra for a few hours, keeping their henna out in the open so they can fully experience the sights and smells of the henna tattoo. The choice is completely up to you! Note: Henna wrapping is optional, J.U. Henna Tattoo is not responsible for any adverse reaction to the hospital-grade medical tape used to wrap the henna. Henna takes 48 hours to fully darken. If you want great henna-stain pictures, try to book your henna appointment a few days before you have your photography session. Complete the appointment request form (located at top of page) to get started on booking your pregnancy henna appointment! If you have any questions, submit it in my FAQ page or email juhennatattoo@gmail.com.